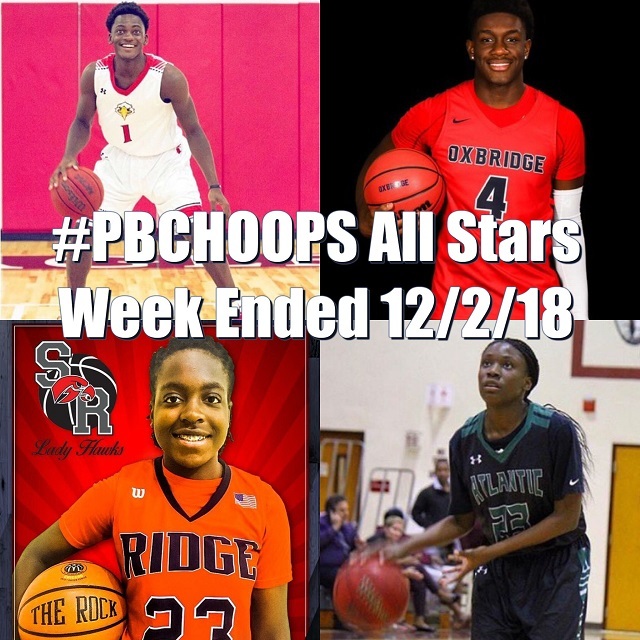 Here are the week's other top performers, our #PBCHOOPS "All Stars" for week ended December 2, 2018. Gedeon Germinal (c/o 2019) - Jupiter Christian | Led the Eagles to 3 big wins last week including a game winning basket against Cardinal Newman on Friday night. Nae'Shawn Goines (c/o 2019) - Lake Worth Christian | Went for 28 points, 6 assists and 5 rebounds in a win Thursday over Boca Christian. Goines also knocked down 6 clutch free throws to seal the victory. Jahnae Midget (c/o 2021) - Seminole Ridge | Dropped 30 points and 7 assists in a big win for the Lady Hawks. Amari Allen (c/o 2020) - Atlantic | Averaged 18.33 points in 3 games for the Lady Eagles who finished the week 2-1. Klein Alexandre (c/o 2019) - Oxbridge Academy | Averaged 16.6 points per game on the week including 28 points in Saturdays win over Palm Beach Central. Well that's a wrap for this weeks All Stars, this will be a weekly feature for the 2018-19 high school season. Be sure to look out tomorrow for the #PBCHOOPS Boys/Girls Player of the Week and continue send in your nominations weekly via DM, email or text.